I have always wanted to see the wild horses at Assateague Island. It never occurred to me that any kind of population control would be necessary to assure enough room and food for all the horses. Fascinating. I have to say, I much prefer a birth control to any other herd reduction considerations. The efforts and life commitment of these scientists to helping maintain a healthy herd is truly most impressive and admirable. Thanks for the information and especially for the book recommendation. This is a topic I'm not very up to speed on, but do hear and read about it from time to time. Thanks for helping me understand the issue a bit better. I know this, I don't have enough info on this topic to give an educated opinion, however every time I read about it, it helps. 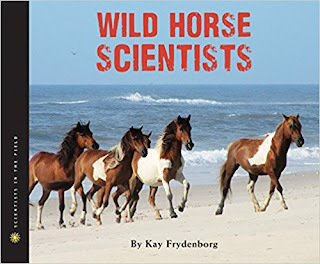 I would enjoy learning more about the scientists who manage the wild horses on Assateague. This book sounds like one I need to read. Thanks for the lead. Have wanted to experience the wild herds there since reading my favorite childhood horse books. Many books targeting older youth readers are outstanding books for adults.